Marvin Foster, one of the great competitive surfers of the 1980's, ended his life at the relatively young age of 49. Legendary big-wave surfer Marvin G. K. "Carvin' Marvin" Foster, whose distinctive tube-riding style continues to be widely emulated, has died. Foster, 49, of Haleiwa, hanged himself, according to the Medical Examiner's Office. Foster's brother identified him Tuesday after he was found in Pupukea. 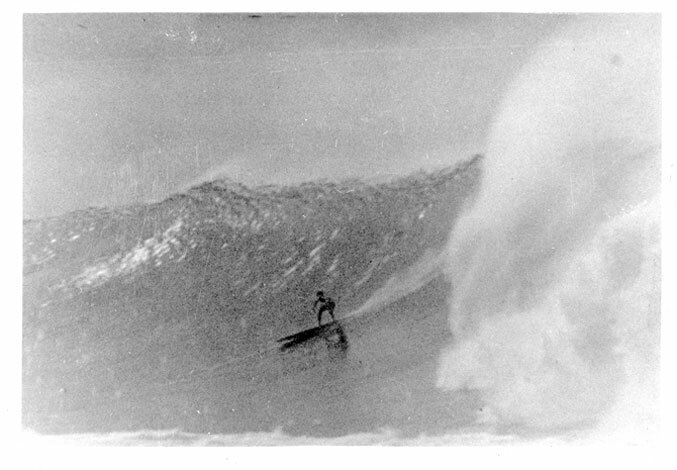 Described as one of the top surfers in the 1970s and '80s, Foster later fell on hard times, battling drugs and serving time in prison in 1993 for possession of prohibited weapons, a felony. But his early years appeared bright. Friends remember him as a fearless pioneer who paved the way for many Hawaii big-waver surfers such as Sunny Garcia. "He was definitely one of the best of the young kids coming up to the '70s," recalls surf photographer Bernie Baker. "He was really at that age sort of the model of the young and very hot Hawaiian kid that we now are able to look at in terms of dozens and dozens today. It was just a great loss of a great Hawaiian spirit at a very young age." Even as a youngster, Foster could surf on all sides of a wave and in any ocean condition, said Baker. Many saw his natural talent when, as a teen, he and his brother, Kalani, charged 10- to 12-foot waves at Laniakea. In 1984 he won an international surfing championship in Peru. The next year he was one of the surfers invited to compete in the first Eddie Aikau big-wave invitational at Sunset Beach. Many recall how Foster was one of a few surfers in his era who could go left at Waimea Bay. "He was highly regarded," said veteran contest director Randy Rarick. Glen Moncata, a representative of Quiksilver, which sponsored Foster, said he has received phone calls from all over the world in the past couple of days from people sharing memories. "He did touch a lot of people in the surfing world," he said. "He's just going to be missed by everybody." Friend Brian Keaulana said Foster helped up-and-coming surfers with his knowledge of the sport and the ocean. "He was an amazing waterman," said Keaulana. His skill ranked with that of Aikau and Keaulana's father, Richard "Buffalo" Keaulana, he added. Foster brought a new flavor to surfing with his back-side barrel technique. "Everybody emulated what Marvin would do in the water," he added. "He can get into the barrel in any which way." Foster was proud of his culture and helped other local surfers in competitions to ensure that Hawaiians were well represented, Keaulana said. "He had a good soul," said former surf contest promoter Reid Inouye. "He was born to do what he did in the water." Calvin “Tulie” Clark was born December 2, 1917, in Azusa, California. He grew up in Redondo Beach, riding his horse to attend Malaga Cove School in 1926, when it opened in Palos Verdes Estates. By age 16 or 17, Tulie was building solid wooden boards for Pacific Ready Cut Homes. Also known as “Pacific Systems Homes,” or just plain “Pacific Systems,” it was one of the first companies to produce commercial surfboards, and the era’s most notable in terms of volume and design. Two separate manufacturers of Tom Blake’s hollow boards had been the first. Pacific Systems, owned by Meyers Butte, in Vernon, in the Los Angeles area, was the next. 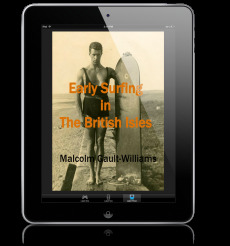 “When I was in Hawaii,” retold noted era surfer Lorrin “Whitey” Harrison, “I was paddling canoes all the time... When I came back from Hawaii with my first wife, we lived in Dana Point. I started fishing commercial, and then I got a motorcycle and rode it all the way to Los Angeles to work at Pacific Redi-cut Systems Homes for a summer. Shortly afterward, Tulie became a member of the famed Palos Verdes Surfing Club (PVSC). “It started a little bit before I did,” remembered another noted surfer E.J. Oshier of the PVSC. “Adie Bayer and Doc Ball put that together. They started 9 months, maybe a year, before I got started… When I started surfing there [at Palos Verdes Cove], Tulie Clark was coming down and… we got along real well with Adie Bayer and Doc Ball and all the guys that were down there. Clark attended Central School in Redondo Beach and Redondo Union High School. After graduating from Venice High in 1940, he lived in Palos Verdes Estates and, later, Palm Springs. In 1936 or ’37, “at age 20, Clark became the first surfer to beat legendary waterman Pete Peterson in a paddling contest” and successfully competed in paddleboard races on into 1942. “Doc [Ball] told me,” Gary Lynch related to me, that “Tulie did not have to go to war. He was an only son and stayed home on the dairy I think it was.” After the war, and after San Onofre had become the epicenter of the Southern California surfer lifestyle, Tulie became a charter member of the San Onofre Surfing Club. He was featured prominently in Doc Ball’s seminal 1946 photo book California Surfers. Tulie went on to become a real estate developer in Torrance, Lancaster, San Jose and the Palos Verdes Estates – building over 5,000 homes by the time he retired. “He was one of the guys… not poverty-stricken, but very down, financially, in his early days,” Doc told me years ago. “Everybody used to get after me about him: ‘What are you doing – a doctor! – messing around with those bums; those surf bums? !’ Holy cow; about flipped my lid! In 1964, Tulie became the main investor for International Surfing magazine, known today as Surfing. Amongst his other notable accomplishments: He rebuilt the mining access road to Bluff Cove; was a Los Angeles County Lifeguard; and was entered into the Pioneer Surfers Walk of Fame. Tulie passed on April 30, 2010 at a care residence, after lengthy struggle with Alzheimer's Disease. Please sign the guest book at www.dailybreeze.com/obits. CLICK Magazine, August 1941, p. 43. Mahalos to Matt Jacobsen for the heads-up on these!